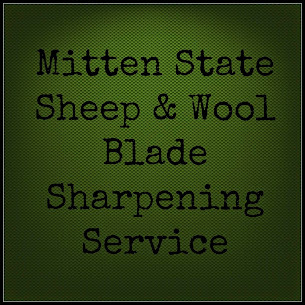 Mitten State Sheep & Wool : Sheep and Summer, What's Not To Love? I love Sheep and I love Summer! I have mentioned before summer is usually the easiest time raising sheep. They generally are left to themselves. We make sure they have clean water and we leave out a loose minerals/salt mixture that is available to them free choice. We have to watch them for parasite load and do worm them twice over the summer as part of a maintenance program. We have had occasional wet summers that have required it to be done more often. That is pretty much it. I think we get back more than we put in during these months. The enjoyment of watching sheep graze, lambs growing and playing, and minimal work. What's not to love? One thing that has been different this spring has been the noise! They have been so much more vocal than we are use to. The ewes had to be fed grain through the winter due to low quality hay. In the past I have been able to get the goats out in the morning to milk without even a glance from the sheep, but this year when they hear that grain bucket they come a running. The whole time I am milking they stand at the gate protesting at the unfairness of it all. It surprises me how loud they can get. Hopefully, they will soon give up and be happy with the grass diet and I can have some peace and quiet in the morning while I am milking. If we had more sheep, part of summer maintenance would include rotating the sheep through the pastures. When we had over 100 head of livestock that was something we did on a regular basis. With our stock rate being so low we have not used the separate paddocks and the sheep have free reign over all of the pasture. As we grow in numbers that will change and pasture rotation will again be used which adds a little bit more work, but not much. I hope everyone is enjoying the season as much as I am! Does your chore load get lighter in the summer? Nice to have a bit of a breather! We looked at a little farm today with just enough room for a wee little flock. I'm keeping my fingers crossed! I always anticipate my work load easing up a bit in the summer, but it usually manages to load up with different things :)Oh well....work while it is still day!! Good Luck with your farm search! Thanks! I wish I could send you some warmer weather. It has been cooler here but we have had some warm days :) I am enjoying every one! I love summer too. And sheep of course. The gang comes to "good morning" me when I start out on my first fence check. My chore liad is definitely heavier due to the garden. That seems like such a peaceful view, a field of grazing sheep. This summer has been great weather wise. Last year we were already counting days of 90 degree heat. And the summer drought had begun. That's so great that things get easier for you in the summer! Gives you a nice little break :) I think our activity really ramps up during the summer because of our garden.